Disclosure: I did receive product in exchange for writing this review. In no way did this influence my opinion of this product/company. These opinions are my own and not those of the company. You all know I love my Glow Bugs. They are super fun, easy to use and wash and hold up against leaks. I think we have over 30 Glow Bugs now! 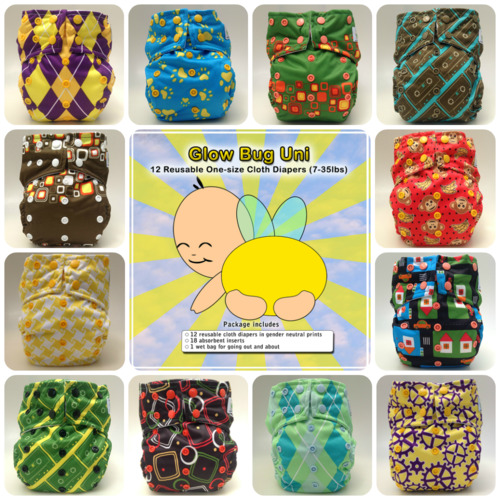 At the end of June I contacted Glow Bug about using some photos/links from their website in a review of the 2012 diaper. Of course these amazing ladies went and did one better and offered to send one us one of their new and improved diapers to review. Ummm...heck yes!?! What's the difference between the old and new diapers? Why the new 360 degree gusset!! This adds extra leak protection to the diaper and it works! Usually when I review a diaper I have to wait and wait for the ultimate test of a diaper...the poop!! Which when you are only working with one of a particular diaper can take a while! Not. This. Time. First time I put this guy on EJ I took it off 20 minutes later. It did the job! Now we still used a liner in this diaper but I patted it down into the gusset and it kept the shape pretty well! Rather than the poop sliding up the back of the diaper it got trapped down in the gusset. These diapers also feature the same snaps as the old diapers. Lots of waist and length sizes and the hip snaps that the 2012 diapers included. Also new to this version was the male and female parts on the inserts so you can snap additional inserts for added absorbency. They still have the great prints from 2012 and added 12 new unisex prints! My verdict? 5 FRICKEN STARS! LOVED this new diaper! The new features are awesome and the overall quality of the diaper just gets better and better! The new unisex prints are fun and colourful AND they are still the same great price! $150 for 12 diapers. I'm seriously considering de-stashing some of my old bugs to trade up for these new ones!